Unquestionably the most difficult aspect of what we do involves saying goodbye to patients we have come to know and love. Often, especially during a prolonged illness, we have become as bonded to our patient’s families as we are to the pet themselves, and it is tremendously difficult to watch them go through the grieving process as they lose a beloved pet. We wanted to have a place to pay tribute to the animal friends we have lost, and to show that they will never be forgotten. This is a place for families as well as our staff to post their memories and photos of our special patients who are no longer with us. 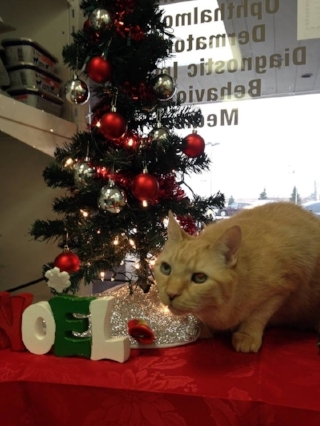 Please feel free to submit anything you wish to have included in this area to info@nelsonanimalhospital.ca. On January 9th, 2019 we lost our special boy. Cody, aka Codybear, was the sweetest, most loving boy you would ever encounter. He loved everyone and would let you know it because when he saw you he would push his head in your hand and whine until you pet him. We had 11 wonderful years with our boy, we were so lucky he chose us to be his family. Although our hearts are broken and the loss we feel is very deep, we are so grateful for the time we had with him. Thank you to the Nelson Animal team for their loving care. We had an extra 4 years with Cody because of their suggestion of a wellness test at 7 years old. We discovered cancer at that time but caught it in time to treat it. Unfortunately it came back 4 years later and had spread enough that it was not treatable. Cody died in my arms at home and the most comforting words I heard were from Dr. Adriana Olijnyk saying that he died with my scent comforting him. Thank you so much for that was exactly what I needed to hear in one of the darkest moments of my life. Cody will be forever in our hearts. My new favorite saying "You were my favorite hello and my hardest goodbye". Truer words could not be spoken. One of the worst days of my life was on Feb. 26th when I had to say goodbye to the sweetest, most loving little girl, - Lucky Loo as we sometimes called her. Lucky was born at Nelson Animal Hospital back on November 8, 2008, when her mom Tasha, gave birth to her and five furry siblings. Lucky had an amazing life with endless love and care. Lucky lived with her mommy Tasha, daddy Chico and her brother Ritchie as well as her human family. They were 4 little dogs with an unbreakable bond. The weekend before that dreadful day of saying goodbye, Lucky was given tons of extra kisses and loves by all of us. Each one of her family member knew she was ill as they were always on the look out for her and what was going on. If Lucky moved the slightest, their ears perked up and they watched her endlessly. We miss Lucky every single day and saying good bye to her was the hardest thing to do. The other three are constantly looking for her, laying in the spot she loved or sniffing her blanket. Lucky had amazing big eyes that would look at you and just melt your heart. She was so loved and now so missed. Lucky loved her blanket being put in the dryer before going to sleep as she loved to cuddle in the warm blanket - yep she was spoiled and so very much loved. She loved us all back unconditionally. I miss seeing her tail go back and forth and around and around when she was asked if she wanted a treat. I miss her coming down the stairs in the morning and seeing her front paw mopping each step as it would go around and around so fast as she ran down the stairs. She brought many smiles to many faces. Her furry buddies miss her so much and my heart will forever have a void that will never be replaced, as part of my heart went with her. She will always be with us and she will never be forgotten. I miss her every single day. We miss you so so so very much sweet little girl. A very handsome boy who will be missed dearly. While Isla was Dr. Quinn's family pet, she really became part of the Nelson family as she spent virtually all of her time at the clinic making sure things were running smoothly. Isla had her favourite chair in the treatment area that gave her a good vantage point to supervise all the goings on, and she would stand and bark at the chair until someone would give her a boost up. Belly rubs were a favourite and she could always manage to get one out of anybody by rolling over and kicking her legs in the air. Emrys and his brother Merlin were surrenders and they made themselves at home here for the remainder of their lives. Unfortunately due to Emrys' bathroom habits he was not the best candidate for re-homing. He was a happy boy and always had one thing on his mind, food :) He enjoyed all the attention from clients coming and going and in his last little while with us, at the age of 15, he seemed to attach himself to Dr. Bilato who didn't seem to mind as he became her daily desk buddy. That was her registered name, but to us she was either “Skye” or “Sweetheart”. On Tuesday, May 27th, we had to say good bye to our oldest furry daughter, Skye, on a beautiful warm and sunny day in our beautiful back garden. We had hoped for a glorious day that, when the time came, our wishes would be to complete her perfect little life in the place that she loved. With Bryon and Ceilidh beside her while I held her in my arms to the end, Dr. (Mommy) Sharon, was so gracious, kind and loving to our little Lady Skye. Skye had many problems throughout her life, so she got to know Mommy Sharon well. For all of you that knew Skye and that touched her life in any way, you knew that she was a very SPECIAL little girl. 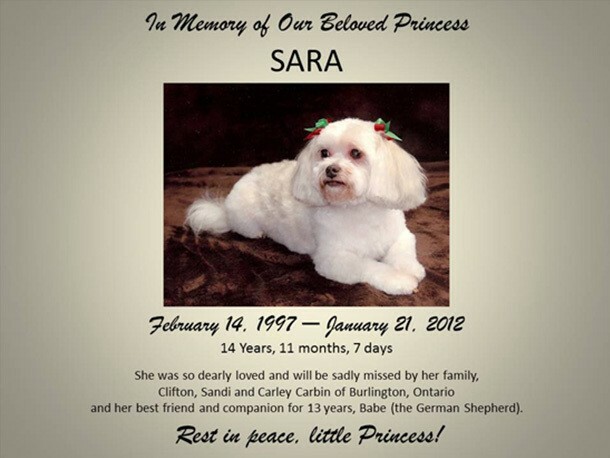 She was a St. John’s ambulance therapy dog for 3 years, giving her love, kisses and hugs to all the aunties and uncles/patients in nursing homes, making life better for the folks that loved her. Skye was a very special little girl in many ways to both Bryon and I and especially her little sister Ceilidh. Skye was able to show Ceilidh how to be a very special furry friend through all the various obstacles of life. Our sweetheart Skye was so very beautiful in every way that for us, it’s so very difficult to believe that she’s no longer here with us. For Bryon, Ceilidh and I, knowing that she is in Heaven with her Mommy “Tinker” and all the furry friends and people that love her, makes life a little easier for Bryon, Ceilidh and I.
It’s difficult to watch Ceilidh continue to keep looking out the dining room window looking for Skye to come back home, but I’m sure in good time Ceilidh will realize that Skye is at peace up in the sky were she belongs and at this time in her life having a good time. You are my SUNSHINE, my only SUNSHINE, you make us HAPPY when Skye’s are grey. You’ll never know dear how much we love you. Please don’t take make sunshine away!! Rest in peace little one!! God loves you Skye, and so do we. Laying on the floor, you on your bed and me on the rug, nose to nose, feeling your warm breath on my face, looking into your groggy eyes. Knowing our time was too short, saying goodbye would be so fast...the separation indefinite. Both of us in agony - yours physical - mine emotional. You were my best friend...my bossy dog. You were convinced I was your human pet. We were constant companions, my scruffy little guy from Bangkok and I. After your hard life as a feral pup fate and an angel brought us together. Our life was one of small, joyous victories: the first time you brought a toy onto the bed to play with it, the first time I tossed a morsel of food to you and you didn't duck, the first time you shyly went up to a stranger on your own, the first time you tapped my leg with your paw to say you wanted to cuddle then leaned in against me, The first time you got out and came back within minutes all by yourself...looking as if you were wondering why we hadn't come with you on your jaunt. Riding shotgun...watching for cows all the way across the country with me. Curling up against me when we were both scared. Eating ice cream cones in summer and Tim bits in winter. Hating to go outside when it was snowy or even just wet. Gods forbid you should get those paws wet. Trying to sleep together on a twin bed with you taking half the space. Trusting me as you had never trusted anyone in your life. Not letting out a whimper of complaint to let me know you were full of cancer until a week before they found it. Leaning against my legs on that last day as if to give me strength. Looking at me with love in your eyes as you went to sleep one last time. We had a special, unbreakable bond buddy. As I was holding you, I told you I would never let you fall...never let you go...and I won't. I'll see you again Ben the dog. I promise. It is with great sadness that we had to say goodbye to our beloved Bogie late in 2012. Bogie was an exceptional little guy. He came to us in his old age battling congestive heart failure. Bogie surprised us all with how well he managed. For such a little dog he had a lot of fight! Bogie warmed right up to the staff at Nelson AH. When he wasn’t snuggled in a blanket somewhere, he would be running and jumping, usually chasing Tripod or Isla. He added a lot of entertainment and enjoyment every day here, and we all loved him very much. Although Bogie will be missed greatly, he will never be forgotten. I've been meaning to write a thank you letter since the passing of my Monty, but as I'm sure you know, it takes some time to get to that point when a pet passes. I adopted Monty when he was 6 weeks old, and he was with me through all of those life changing years - going to university for the first time, moving into my first apartment, buying my new house, getting my first job, having my son, buying my first house and everything in between. He was the constant companion in my life that was always there and he had a calmness about him that always made me feel safe and stay positive. He greeted my every morning, and he was always waiting for me when I came home each day. He laid with me when I was sick – he was my strength, my protector, my family, my best friend. He wasn't jealous when my son was born. He just accepted him as part of our pack. He sat with me when I fed him, and he laid protectively by his crib at night, he came to me in the middle of the night when he cried, and he sat loyally by my side when I rocked my son back to sleep. He was never aggressive. He was protective, and he was never dominant, only confident – he looked to me for guidance. He would have laid down his own life in a heartbeat to protect me and his family, and he would have done it with all of the confidence and grace that only a good dog can. He tore his ACL about 6 years ago, and I was devastated. But Dr. Grant and everyone at Nelson animal hospital was amazing. They arranged his surgery and provided real and genuine aftercare – they went above and beyond in making sure that he was well cared for, and he recovered perfectly. One year later, he went through the same ordeal with his other leg, and just as was before, everyone at NAH jumped in to help him through it. Two surgeries later and a lot of TLC and my Monty was back to normal, fetching his Kong, hiking, swimming and just being a dog! I don't think he would've recovered as well as he did without Dr. Grant and everyone at Nelson Animal Hospital. He was then labelled the bionic dog, and he lived just as he always had with two metal plates in his leg. 6 months ago, He became ill at the age of 11. The slow decline and years of old age that I was looking forward to with my Monty were not to be, as a week later he passed away. One of the worst moments of my life was having to say goodbye to him, but his passing was made easier by the fact that he was laid to rest at Nelson Animal Hospital with dignity, respect and those that loved him by his side. Dr. Grant wasn't in the office when I brought my Monty in and had to make the awful decision to have him put to sleep, but another veterinarian was there as well as her staff, and they made the whole process very serene and peaceful for us. With his family by his side, my 4 year old son said, “Bye-bye Monty. We'll miss you,” and Monty lifted his head one last time, gave my son a big lick on his face, layed his head to rest and closed his eyes for the last time. Every pet owner knows the sadness of out-living your companion, but the years spent with them often make the sadness worth it. Having a good vet to be there during your animal’s life, especially at the end, makes the whole process of saying goodbye a little easier. I want to thank everyone at Nelson, especially Dr. Grant, for their compassion, hard work and dedication and for making the clinic more than just a clinic. They take the time to know their animals, and they go above and beyond. My Monty lived a full life, and he passed with dignity because of them, so thank you. Qzar Iben Aswan, affectionately known as Quazy, was a bronze Egyptian Mau and the most beautiful cat I’ve ever seen. When we got him, there were only 2 breeders in Canada and maybe 5 breeders in all of North America. He was a rare beauty. He was a cross between the African Serval cat and the original Egyptian cat. He was a show cat. He was disqualified because he had a crook in his tail. A vet said it looked like it was broken and he could probably fix it. We opted not to do that. We first got him when he was 9 months old. He wouldn’t let anyone near him. I would sit in the kitchen the nights Ray was out and read out loud so he would get used to me. One night, as he was walking by me, I managed to stroke the last 4 inches of his tail. He stood still and just shivered with pleasure with his back arched, and he stood up tall. He was remarkably muscular and slim with a stiff tail and very long fingers. He wouldn’t drink still water, so I put lots of water in a plastic loaf pan and he would jerk it to get it moving before he would drink. There was often water spilled over the floor and the pan would be moved around. Sometimes the pan would be in the way, and I would accidentally kick it and spill more. He loved his water. There could be a cooked chicken sitting out on the table, and he wasn’t interested. If you left your glass of water unattended, he’d be drinking it. He was always on the lookout for water. He was a very gentle guy and shy. When he wanted my attention, he would very gently place his paw on my lap. I had a top cupboard in the kitchen that I kept empty because he liked to sit in there and watch whatever was going on (maybe it was his royal lineage, wanting to look down on everything). When he was young, he could jump from the floor to the top of the fridge, a height of 6 feet. I often called him an undercover cat, because he could be found sleeping under the bed covers or under a throw blanket in the living room. He loved to play. One of his favourite toys was an elastic band. He would hold it down with one paw and use his other paw to pull on it and make it snap. Occasionally, it would smack him back. Sometimes I would put the elastic under a scatter rug and let just a small piece jut out. Found treasure is always the best. Years ago, I used to keep his cat food in a lower kitchen cupboard. He would pull on the door to make it rattle to tell me he was hungry. I moved the cat food long ago but he still rattled the door (I had him on demand feeding, and he could be demanding). His sometimes reminded me of a mountain goat. He liked to balance himself on the back of a kitchen chair that had only a ¾ inch wide back. I loved him, and I miss him. Why do I walk in the driving rain and blowing snow? Because you don’t understand the word "weather". Why do I crawl out of bed on a Saturday morning? Because "weekend" means nothing to you. Why do I save the last bite of every meal? Because your eyes look eternally hopeful. Why do I look to my front window as I enter the driveway? Why do I feel a load lift as I turn the key in the lock? loving me no matter what. Written and submitted by Ruth M. in loving memory of Brady. Tana was adopted by Dr. Grant from the Ontario Veterinary College, during her very first week of veterinary school. Tana had been taken in by the school as her owner suffered from a serious medical problem and could not keep her. Dr. Grant couldn’t say no to the sad looking 8 year old golden retriever – a sign of things to come! Tana was a constant companion to Dr. Grant and her son Michael during their years at the University of Guelph, living for her meals (what golden doesn’t?! ), her walks with friends, and her swims in the local river. Tana had her share of medical problems, including chronic skin conditions related to food and environmental allergies. She also developed a neurological issue over her last several months. Tana spent all of her time with Austin, and it was touching to see how Austin would fuss over her as her health problems worsened. More than once as she became weaker, when Tana stumbled and lost her balance, Austin stayed with her and alerted us by barking. She made it to the ripe old age of 17, an astounding feat for a golden retriever! Sadly, Tana was euthanized over the Easter weekend in 2009 due to a deterioration in her condition. She will be missed but long remembered as a wonderful friend! Buddha was our beloved pet ferret and friend to many. He lived a very long and healthy life and outlived the average life expectancy for ferrets despite his diagnosed insulinoma for which he required 2 daily doses of oral meds. He also had a perineal urethrostomy procedure, which is a re-routing of his urinary tract, following the removal of a malignant tumour in the area. This procedure allowed him to live for another year with great quality of life. Buddha loved to scamper around the clinic and in his younger days would race Austin for a thrown ball or chew toy. After chasing the dogs around we would usually find him curled up in the pile of folded laundry or dog bed in one of the kennels. He also loved to fall asleep curled up in the mop head! 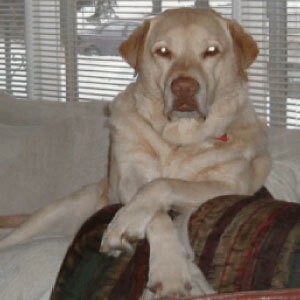 We will greatly miss Buddha, and he will always be remembered by the staff and clients here at Nelson Animal Hospital. Her loving head upon my knee. She read me like a book, silently. By chance in a pet store I met you. You stole my heart playing peek-a-boo. 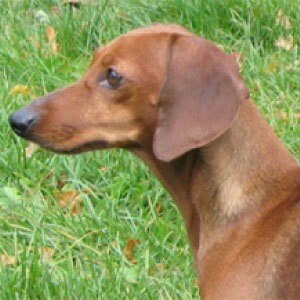 Wiener, you were my gorgeous Princess Doxy, my spirited “pistol” brimming with moxy. Such adorable “mitts”, my favourite front feet, like a lab with short legs, she lived to eat. Faithfully worshipping the warmth of the sun, toys with no squeaker just simply weren’t fun. She'll no longer come to us when we call, retrieving no more her favourite ball. Next to me in bed she’ll no longer sleep. Her diva pillow beside me, I’ll always keep. A tiny dear boy really misses his sister. Pickles is his name, but he’ll answer to Mister. He sits in your crate near the patio door. We’d give anything to have you for one moment more. Time will heal our hearts and numb the pain. Our #1 girl you will forever remain. We found Millie on Thanksgiving on our way home from the Simcoe fair. The breeder said she was the runt and "not worth much". Silly man! It didn't take her long to become part of our family. Our lives quickly became richer as the days filled with memories, like her groans in the middle of the night as she adjusted in her sleep, almost pushing Tom or Katie from their beds at home or at the cottage. Black toe nails clicking on the floor. Tail banging against the wall or chairs. Patiently waiting for a bit of peanut butter and toast at breakfast. The excited little jumps and whines when she heard the kids coming to play. The stoic look of slight disgust when our "friend" cat, Misca, drank from her water. Head down, tail up, soaking up the smells along the trails at RBG, or Bronte creek. The little show she'd put on just for us, chasing squirrels and ducks on the way for a swim at the lake. Wasn't that what labs are supposed to do? We would chuckle because we knew she wouldn't hurt them even if she caught them. Millie didn't have a mean bone in her body. Trotting back for a treat or a pat, wagging her hind end and tail for all, it was worth waiting until she was right next to us to shake off and give us all a good soaking. She had such a mournful look of "Where's mine?" on Christmas morning. What fun seeing her rip all those layers of paper. Then carrying around her stuffed frog soft in her mouth as it if was a baby. Quick! Close your eyes Brody and Rhys! Millie's incoming to tidy you up and clean any stray bits of food from your faces. We know it’s fun, but did you really have to give Millie the whole banana muffin? All those big and little people coming over to pet our joy magnet on our strolls around town. The smooth cool nose poking around us when we opened the fridge to give her a carrot. Soft kisses on our faces, warm head gently pushing against our knees, velvet ears between our fingers, deep brown eyes filled with love, kindness and understanding. Thank you for making us your own very special ones. Have fun with your old friends. We know you'll have no trouble making new ones. Till we see you again. On March 17, 2011, we lost someone very special to us when Austin, our 14 year old Labrador retriever, passed away peacefully surrounded by staff and beloved friends. Just over four years ago, Austin came to us when he was surrendered by a family who could no longer care for him. Initially he was a fixture in the waiting room, greeting clients, but as he became older and lost his vision he spent less time up there. Austin had his share of health issues, but always seemed content and had a tail that never stopped. He had a feisty side, and this became more apparent as he realized he had certain members of the staff wrapped around his little toe. If you had a treat in your pocket or were even standing in the vicinity of a cookie jar, he knew it. You would be barked at and nudged incessantly, and were not going to get any rest until you gave it up. His begging face was irresistible – he would wrinkle his eyebrows, tilt his head, and his whole body would wriggle as he tried to convince you he was starving. At the same time, Austin was one of the most sensitive, gentle, eager-to-please, and loving dogs I have ever known. He was one of us, and we have numerous stories of how he bonded to other animals in our hospital, be they dog, cat, or even a ferret in one case. We were on a family vacation in Mexico over the March break when Austin suddenly became ill. Dr. Kean and the rest of our team worked with him to try and figure out what was wrong. Blood work, x-rays, and an ultrasound revealed that there was an intestinal obstruction and free fluid within his abdomen. The only likely cause for this in Austin’s case was an intestinal tumour that had become obstructive. He was deteriorating quickly, and as his prognosis was grave, we made the heartbreaking decision together to euthanize our beautiful boy. The girls told me that even on that final day that tail of his, that could knock you off your feet when he was in his prime, still managed to thump the floor when he heard old familiar voices. As heartbroken as we all were, and as devastated as I was not to be with him, I know that he left us that day at peace and surrounded by more love than he could ever have asked for. Thank you from the bottom of my heart to Krista, Samantha, Melanie, Melissa, Chrissy, Virginia, Abbie, Kelly, Jenn, Trevor, and Emily for the love you gave to our Austin, not just in his final hours, but every day of his life. We are so fortunate to have such a wonderful team of people and such dear friends at our hospital. I’ve always known it, but to experience it first-hand when the shoe was on the other foot, so-to-speak, was eye-opening. Austin, I miss tripping over you dozens of times each day more than I can say. We know you are up there with Tana, Brady, Molly, Chester, Suzie, and so many others who are so painfully missed. I hope those stiff old legs are young again, that you can see squirrels a mile away, and that you know how loved you were by so many. We will meet again over the Rainbow Bridge.